Tattooed Steve's Storage Unit of Terror: He's not evil he's just painted that way! 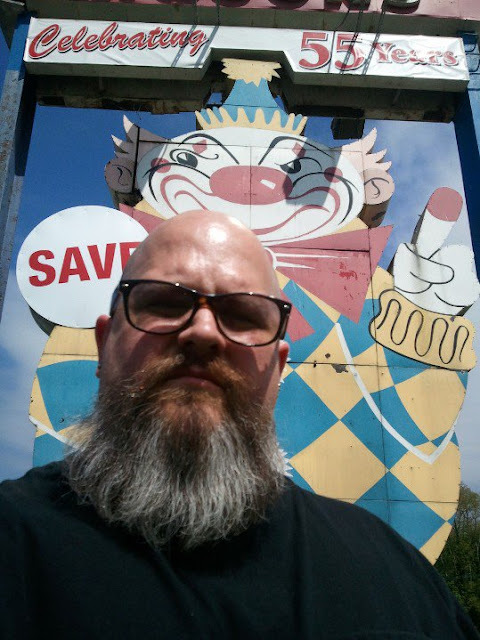 His name is Calico The Clown, but is also known as "The Evil Clown of Middletown". And he has been a happy sight for me on car rides home my whole life. Calico on his 55th Birthday back in 2011 and before his restoration. Come to think of it he was the main reason why I was never afraid of clowns! While other kids would be afraid of one wherever we were I would be like "Please I know one that's twenty three feet tall and would stomp this one flat, then scrape him off his clown shoe!" And it's just a comfort knowing he's there. Like no matter how the landscape of New Jersey changes Calico will always be standing by the side of Highway 35. And no matter where I go he'll still be there keeping the 70's and 80's Jersey I loved alive. I'm still proud to say "I was born and raised in New Jersey, but everything changed much. I mean I would spend an entire Summer going to every Dark Ride and walk through Haunt in The Shore Area (and there were allot including Palace Amusements in Asbury Park), then there was the local Drive in movie in Hazlet and two movie theaters in walking distance (Hazlet and Middletown) and Gary's Now and Then Records was the best place to get music and concert shirts. Then there was clubs up and down Highways 35 and 36 that always had headlining bands and that's not even counting The Stone Pony and The Fastlane in Asbury Park. And I can't even say "Birch Hill" to friends of mine without seeing a smile and hearing about which bands they had seen there. 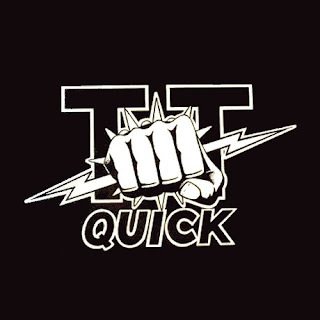 And not only were there Headliners always playing there were allot of great local bands too like TT Quick and China White. But Calico's still there. He stood his ground against her worst and is still a comforting reminder of where I come from. No matter where life may take me in the following years, I can always see him somewhere and say "That's right I know him!" When I had the idea to write about him I decided to do a little research and found out that he has a really cool history. Back in 1955 he was thought up at a kitchen table when Joe Azzolina Sr. along with Lou Scaduto Sr. had a get together with family members to see what the store's name should be. They had decided on Food Circus and keeping with that theme decided a clown would make a great mascot. I had read that a (Homelier) version was created at first, but they had decided to go with another design by late artist Leslie W. Thomas of the Roadside Ad Company. He was erected in 1956 for $18,000.00 and slowly rotated with a motor. I can't even imagine what he would have cost now to have built today. He's appeared in Phillip Botti's movie "Middletown", Calico made the cover of Weird N.J. Magazine (As The Evil Clown of Middletown), had an appearance on "The Tonight Show" when Kevin Smith was doing a segment called "Roadside New Jersey" *There's a bonus story attached to this* and Calico is in the opening sequence of Kevin Smith's CLERKS II as well as having his picture on the wall in The Mooby restaurant. 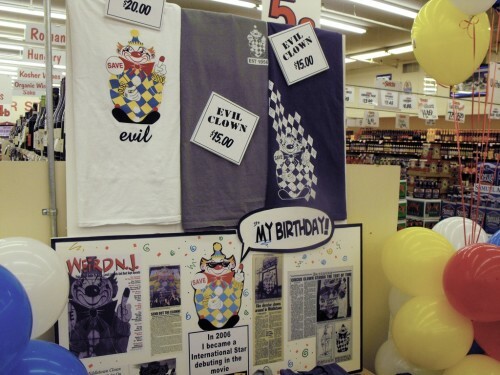 And on his 55th Birthday T-Shirts were available of him in the Food Circus/Foodtown stores and in both Spirits Unlimited locations. And may he be there for many many more! 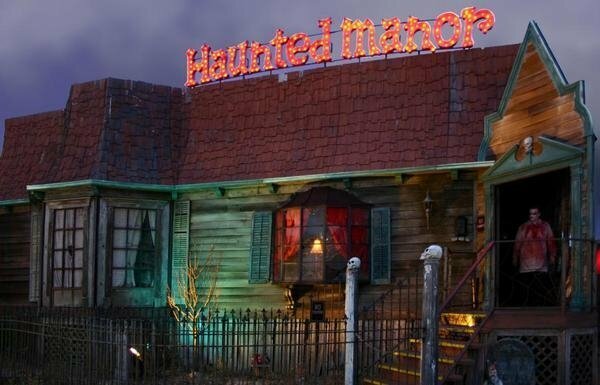 Back when Hollowgraves Haunted Manor was still in Seaside N.J. Kevin Smith had stopped by with "Comic Book Men" Mike Zapcic (Waaaaay before the show). Kevin was looking for locations for the cameraman to shoot when he spotted me and asked about The Bros. Grim Circus Sidehow. I told him that I was friends with Ken and the performers and they would definitely be cool with it. The only thing was they wouldn't be at the show tent for about a half hour, so Kevin and I got caught up on things that were going on since I hadn't seen him in a while and I asked him and Mike if they wanted to go through the haunt. Mike Zapcic was all about it, but Kevin froze to the spot like I asked him to jump off of The Tower of Fear with me. He looked right at me and said "I am beyond scared of these things, no way!" 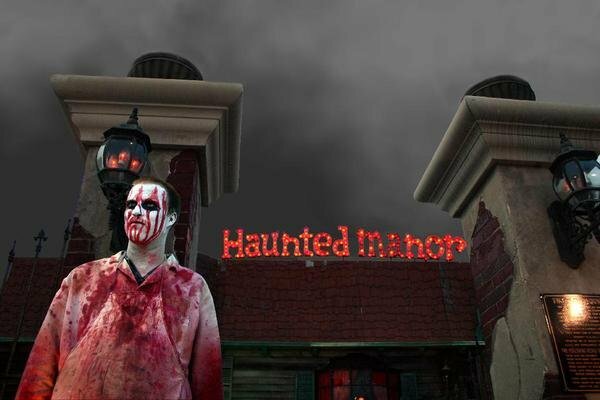 Soooo the three of us went through with the house lights on so he could see all of the animatronics and the haunt set up. And he actually liked it. Mike was liked it too, but he was cracking up watching Kevin inch along like something was waiting to jump out at him. Then after Kevin's tour I introduced him to everyone at The Sidehow and they all had a blast doing their routines for Kevin's spot. And it was great seeing Kevin get star struck meeting The Enigma and Katzen The Tiger Lady. Then those two getting excited to meet Kevin Smith. If that weren't enough a couple years later John Watt had went to Kevin's Q and A at The Count Basie Theater in Red Bank New Jersey. John was able to get to the question microphone and asked Kevin about it. Kevin laughed admitted to it and then told the entire story to the crowd there.